This level has medium difficulty. 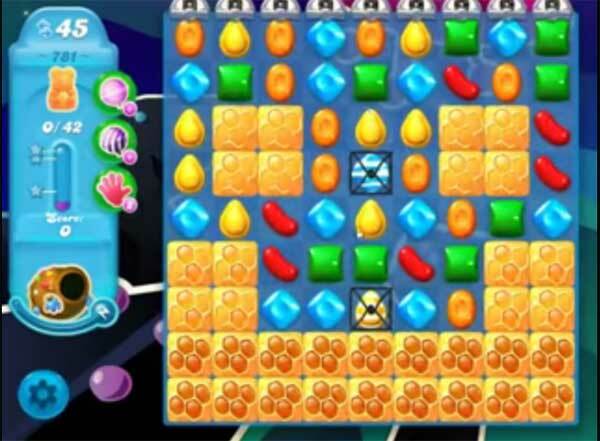 For this level try to play more from the bottom part of the board to shuffle the candies as it will give more chance to make special candy or play near to Honey blockers to break them. Combine special candies with each other to break more honey blockers to save all bears. Another level that doesn’t have enough moves. This is more than medium difficulty!! And you can’t play from the bottom on the 2nd screen, and you use MORE than 1/2 your moves on the 1st screen. EXACTLY why I STOPPED PLAYING CANDY CRUSH!!! My version only has 40 moves. It’s impossible to do as you can’t clear the bottom row on the second screen…..
Only 40 moves. Can’t waste anymore time on this level. Adios CSC. I just got to this level today so I haven’t beat it yet. I only have 40 moves as well but watching the video there are still 7 moves remaining so obviously it’s possible to do it in 40 moves. I hope! After 3 tries I beat it!! Now for the next level so I’ll be watching the next video! I realize this game requires some skill and I don’t have that much but I don’t see how you can win it unless you just luck out and they give you a board that’s rigged to win. In the past that’s what happens to me, I eventually win in spite of myself. I mean, I’m not a complete dunce but at this point the best I can usually do is top 5 to top 10 with a few 1’s here and there. More top tens the higher we go. I hate giving up but I might have to on this one.